Last weekend I checked off an item on my “bucket list” and visited Fire Island, a magic strip of sand 30 miles long resting between The Great South Bay and the Atlantic Ocean. It was as I had anticipated—a magical weekend with our surrogate grandchildren: Sam (10), Julianna (8), and Cece (3). These three along with their parents, Ken and Lynn Marran, live across the street from our old address in Mendham, NJ. Ken and Lynn came to Mt. Paul Road as bride and groom, buying the house across from us, a small replica of our house that was originally built for a mother-in-law. Over the years, the Marrans have transformed the house so that it is now a very large and very lovely family dwelling, a show place really, where Ken’s design skills and Lynn’s gardening expertise are evident. Last year Ken inherited the house on Fire Island, a house that had been in his family for three generations. Early in the 20th Century, his grandmother bought lots of “cheap land” and built a summer house, which now belongs to Ken’s sister. Eventually, uncles and then Ken’s parents built homes there. Now, at Water Island there are lots of Finneys and lots of Marrans. One gets to the island of no cars by ferry or boat in a ten-minute ride across the Bay. Water Island is a community of 58 houses and many of the residents are related to each other. There are also a few celebrities summering there including fashion designer Michael Kors. Lynn had purchased two of his designer canvas tote bags for a fundraiser at the children’s school. She intends to fill the bags with beach towels to enhance their value. I suggested the items would have even more value if she got Michael Kors to sign the bags. There was lots of discussion about how she might approach him to get the signatures. It was decided that Sam would take the bags to the dock on Sunday morning, where a weekend ritual is for vacationers to gather there to wait for the ferry bringing in the newspaper. Michael Kors is usually one of those waiting for the paper. So Sam took blond and adorable three-year-old Cece with him up to greet Mr. Kors and said,” Will you sign my bags for a school fundraiser?” Well, who could resist? Michael Kors smiled, said “Sure,” and signed the bags. Another ritual is gathering on the dock in the evening. The dock is close by the Marrans’ home. Water Islanders gather at these spot, drinks in hand, staring at the water and appreciating what is inevitably a spectacular sundown. Hey, there’s no cable, no TV! This is indeed a special place, where Ken has spent 43 summers, having come for the first time when he was six months old. A childhood friend of Ken’s was also visiting the island and it was fun to hear the two of them reminiscing about when they were kids and how they would “steal” their parents’ “liquid refreshments” and sleep on the beach. Over the years, the water has taken much of the beach on the Bay side, and Ken, an environmental engineer, has led a campaign to put in bulkheads, a sea wall to protect the homes there. He has already received federal, state and local approval for the project that will move forward in the fall. Fire Island is a special place, and I loved splashing in the water, reading on the beach with Wylene, eating delicious meals on the deck, riding in Ken’s boat, visiting with the Marrans and their friends, and observing the wonderful parenting of Ken and Lynn. 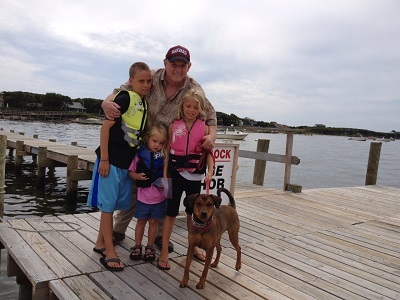 Ken and Lynn are special parents who have given their children these memorable days at Fire Island as well as a gift the children have not yet recognized. Besides the fun times at the island on weekends – the jumping in the waves, building sand castles on the beach, swimming in the pool, playing board games, roasting marshmallows, there is no TV. Time here is spent with family and friends, and despite early protests, the children have no electronic games or hand-held devices. In place of technology, there are weekly visits to the library and there is a cash prize for numbers of books read. Julianna has read over 30 books this summer and Sam is not far behind. While not an easy rule to enforce at first, Ken and Lynn say it’s easier now. As an educator and a “too late, too smart” parent, I wish I could, like Bill Maher, create a “New Rule.” Mine would be a “New Rule for Education.” First New Rule: No TV, No Technology till students are age 10 or 12. Rule 2: There is a value in “rote” memorizing such as multiplication tables, the names of states, countries, continents. Rule 3: Have children play lots of board and card games. These are great for developing social skills and good sportsmanship—and many are great for teaching math skills. (Ken taught Sam, Julianna and me to play poker.) All in all, it was a special time in a special place with wonderful experiences and terrific people. Fire Island was a great summer escape.